Think oatmeal, and you think breakfast. 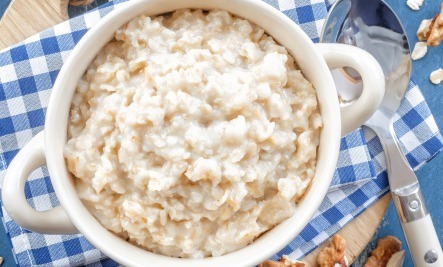 No doubt a hearty bowl of oatmeal is a wonderful way to gear up for the day. It is rich in both insoluble and soluble fiber, which keep you feeling satisfied for a long time. At just 165 calories per cup, it is also helpful for those watching their weight. But oatmeal as dinner merits attention, too, for its sleep-promoting qualities. Avena sativa, a wonderful herb derived from oats, has been used for centuries for its numerous health benefits. One of those uses is to soothe the brain and nervous system. Oatmeal is one of the best sources of melatonin, a natural hormone that helps the body produce more tryptophan, an essential amino acid that promotes good sleep. Interestingly, melatonin is also called “the hormone of darkness” because the body secretes it only at bedtime. The complex carbohydrates in oatmeal also boost the production of tryptophan. The recommendation to enjoy oatmeal and skimmed milk at bedtime comes from the National Sleep Foundation, which suggests that the best sleep-friendly meals combine a carbohydrate and a protein. Another powerful component of oatmeal is the B brigade: it contains many B vitamins, among them Vitamin B6, which governs effective nerve communication in your brain. But my favorite reason for eating oats at night: they taste wonderfully comforting and warm on a cold night! Just be careful not to mix the oats with the morning coffee, which may leach the iron from the blood . . .
All kids should have a routine bowl of oatmeal before bed. Oats it is then.. & if that doesn't work I'll bonk myself on the head with the empty bowl..
Sleep better? Does it really works?